A surprisingly candid look inside the monumental career of one of the most powerful and legendary talk-show hosts, and the final year of the nightly television program that has been close to all our hearts. After more than a half century of asking questions, in 2010 Larry king suddenly found everyone wanted answers from him. why was Larry King Live, CNN's highest-rated program, ending after three decades? was Larry getting divorced again? 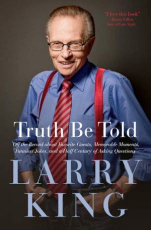 Truth Be Told is a deeply revealing look at the broadcast legend as he dealt with marriage upheaval, the ensuing paparazzi and tabloid controversy, prostate cancer, the twenty-fifth anniversary of Larry King Live, and ultimately, his decision to leave the show to pursue a secret dream -- stand- up comedy. Larry reflects on how much the world has changed around him over the course of his fifty-year career, and the riveting conversations he's had with the most compelling figures in politics, entertainment, medicine, and technology. in these pages, Larry also shares his most memorable moments with singers and songwriters (from Sinatra to Lady Gaga); actors (from Marlon Brando to Al Pacino); billionaires (the high-profile Donald Trump and the low-profile Carlos Slim); world leaders (Barack Obama, Vladimir Putin, Mahmoud Ahmadinejad); crooks (Bernie Madoff, the interview that got away); comedians (from Lenny Bruce to Jerry Seinfeld to Chris Rock); and a host of others.